Make unique creations with the Aquabeads Deluxe Studio. 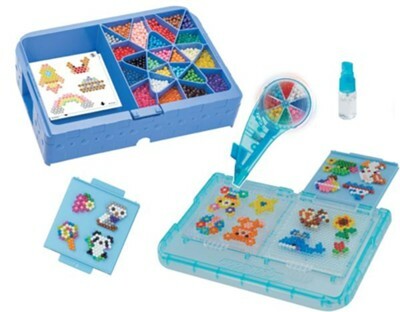 Designed for ages 4 years and older, this set includes over 1300 jewel and solid beads in 24 colors, tool case with bead palette and layout table with 2 flip trays, rainbow bead pen, sprayer, 3 double-sided template sheets and instructions. Just make, spray, flip tray and they stay! Can be combined with the Beginners Studio (sold separately). Package measures 16.3"W x 3"D x 11.8"H.
I'm the author/artist and I want to review Aquabeads Deluxe Studio.